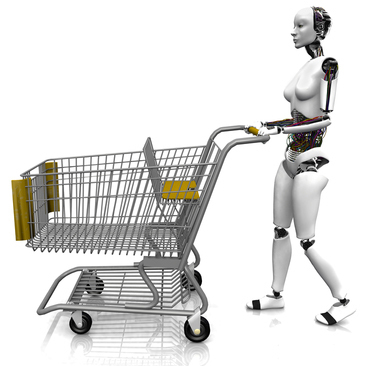 The design of many modern retail stores have been partly informed by cybernetics theory. No, that doesn’t mean they have been designed for futuristic robot shoppers – it just means a simple stimulus-response model is used to guide shoppers through the store. Applied to social sciences, retailers who design their store experience with cybernetics in mind lean on existing quantitative and qualitative research – for example, studies show that most people prefer to walk around a store counter-clockwise, so a savvy grocer will put half the things you need on one side of the store as you enter and the other half on the opposite side of the store. Then while you’re walking the path between the produce and the milk, you’ll be bombarded with visual cues to buy all the other products you might not really need. During the bricks and mortar shopping era, grocery stores and retail stores alike could be looked at as “closed loop” systems. Shoppers enter, get feedback from their environment and generate a certain response as a result. But in an e-commerce age and armed with smartphones, shoppers are now reaching outside that closed loop to get feedback. A product on display in one store might be treated as just a demo by a customer, who will then search for a better price online and make the purchase elsewhere. Related Story | What kind of shopper are you? So is cybernetic theory now useless for retailers? Maybe not if you can map the customer user experience across new digital channels as well. That’s exactly what Delvinia is looking to do with its new CX Mapping program. Leaning on the survey research provided by its online polling community AskingCanadians, Delvinia promises to help businesses better understand how customers are interacting with their products and services inside the store and online and what the new path to purchase looks like. Some of the early clients of the Toronto-based firm’s new program include Manulife Financial, Microsoft, and RBC Royal Bank.